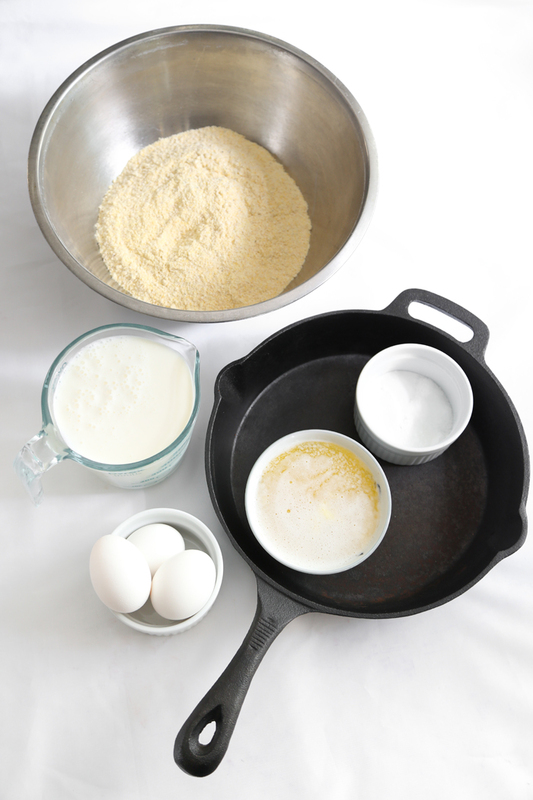 You’ll need some good all-purpose yellow stone-ground cornmeal, buttermilk, eggs, butter, salt and baking leavens. You can make this bread in a 10-inch cake tin with deep sides (like a spring-form pan), but a 10-inch cast-iron skillet is going to yield the best, crispiest cornbread crust. I suggest you use one if at all possible. I like to have the oven pre-heated and all of the ingredients measured and ready to hand before I stir the batter together. First thing, put the skillet in the oven while you prepare the batter. 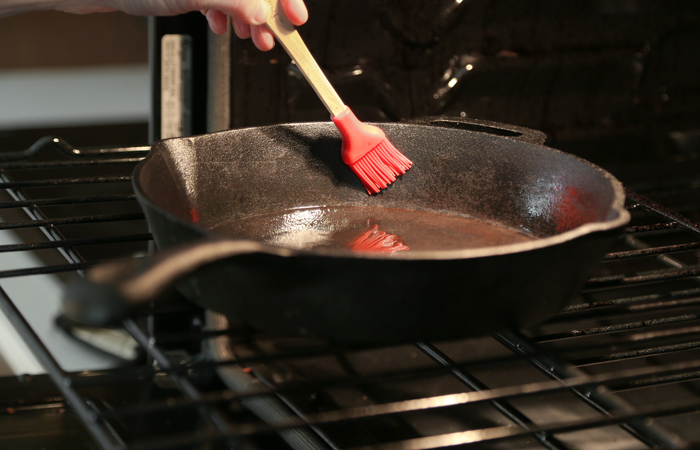 After the butter is melted, reserve one tablespoon for greasing the skillet. Sometimes I use a tablespoon of bacon fat, so you can omit this step if you happen to have that on hand. Stir together with a wooden spoon. Pour the batter into the pan. It will almost completely fill a 10-inch cast-iron skillet to the top, which may make you nervous about the batter overflowing while baking, but it won’t –I promise! My cornbread usually takes about 25 to 30 minutes to cook through at 375°F. Just look! This recipe makes the tallest, fluffiest cornbread with the perfect crumble. Sometimes I’ll eat a warm slice stuffed with salted butter for dinner and nothing else! Although we like it with a bowl of chili, I also like the southern tradition of crumbling it into a tall glass of milk and eating it like cereal (I know, so weird!). 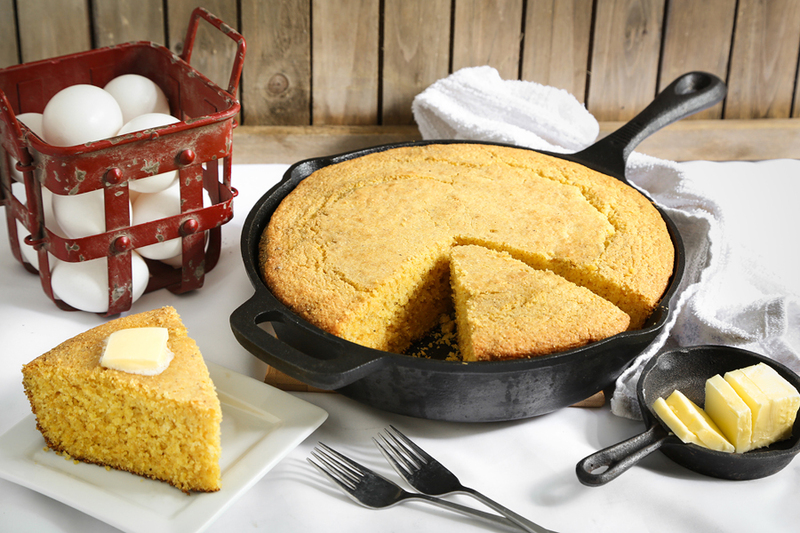 This type of unsweet cornbread should always be enjoyed warm (unless you’re trying my cornbread-in-milk treat). Slices re-heat well in the microwave at 20-30 seconds cook time, or you can stuff slices with butter and wrap them in foil before re-heating them in the oven for about 10 minutes at 350°F. If you don’t have a cast iron skillet, I use and recommend this one for this recipe. 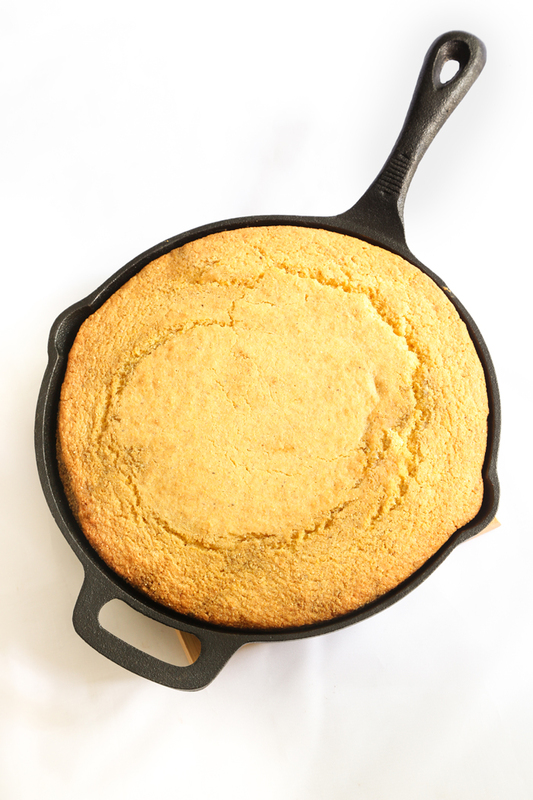 Note: If you're a sweet cornbread fan, then 3 tablespoons to 1/4 cup granulated sugar can be added to the dry ingredients. Preheat the oven to 375°F. When the oven is preheated, place a 10-inch cast-iron skillet in the oven while you prepare the batter. 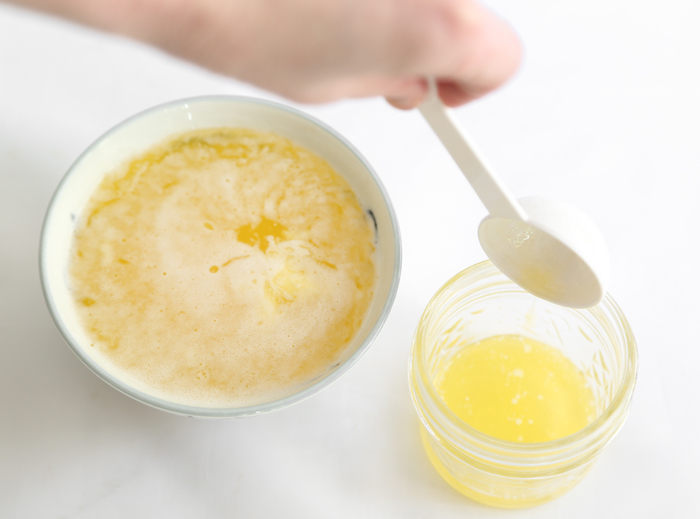 Melt the unsalted butter in a small saucepan or in the microwave at 30 second intervals. Set aside one tablespoon of the melted butter. 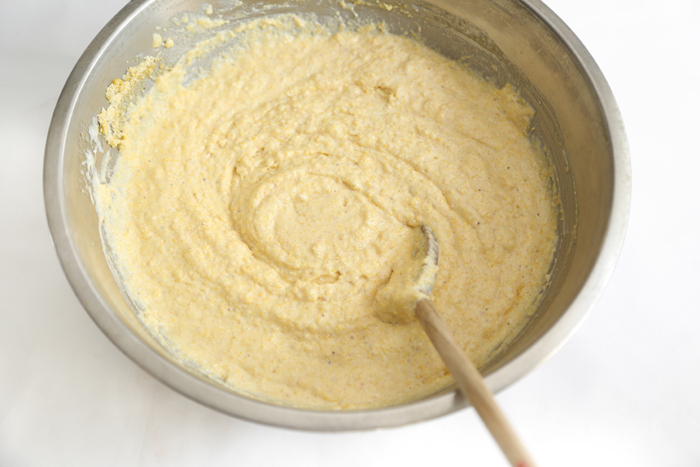 Whisk the eggs together well in a medium bowl and pour in the buttermilk; stir until well mixed. 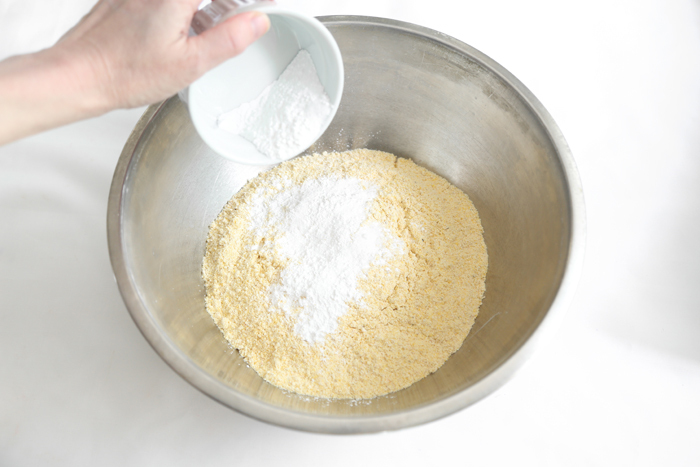 In a separate large bowl, whisk together the corn meal, baking powder, soda and salt. 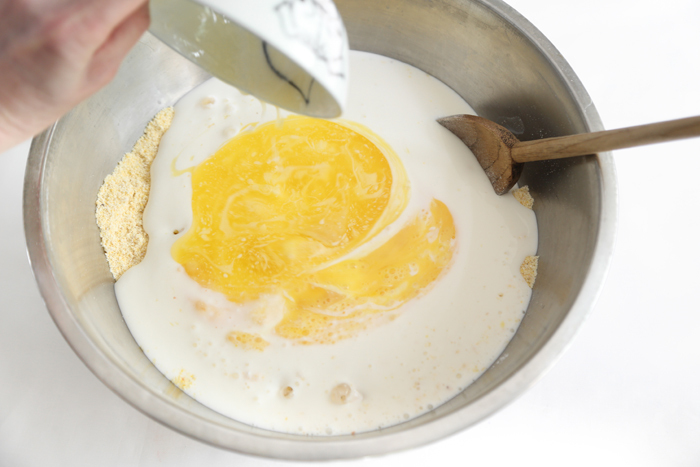 Add the buttermilk mixture and melted butter; stir together with a wooden spoon. Open the oven door and pull out the oven rack with the cast-iron pan on it. Carefully pour in the 1 tablespoon reserved butter and brush the pan until the interior is completely covered. (Please pay attention that your forearms do not touch the oven rack to avoid burns – been there too many times!) Pour the batter into the pan; the batter will sizzle. It’s okay if the batter looks a little ragged on top. Just smooth it evenly the best that you can with the wooden spoon. Bake for 25-30 minutes, or until a skewer inserted in the center comes out clean. Serve slices warm with salted butter. Slices re-heat well in the microwave at 20-30 seconds cook time, or you can stuff slices with butter and wrap them in foil before re-heating them in the oven for about 10 minutes at 350°F. My grandma married a true southern boy from VanBuren, Missouri and she likes to tell of her experience of eating cornbread at their table for the first time ... blech! No sugar! It's definitely a shock if it's not what you're used to :) Your cornbread is so tall and beautiful! How funny! Yes, it's definitely a regional thing. I can appreciate sweet cornbread on occasion - as long as it's not as sweet as yellow cake, which I recently experienced! I have bought very good mixes and I am not a mix person..but never had a great recipe..I bet I do now.Thanks! It looks heavenly and perfect! Cornbreads are so scrumptious. Thi cornbread looks so delicious! Ah -- forgot to call-out & give you your gold star for the absence of flour as well with my earlier compliment on behalf of my Kentucky relatives. 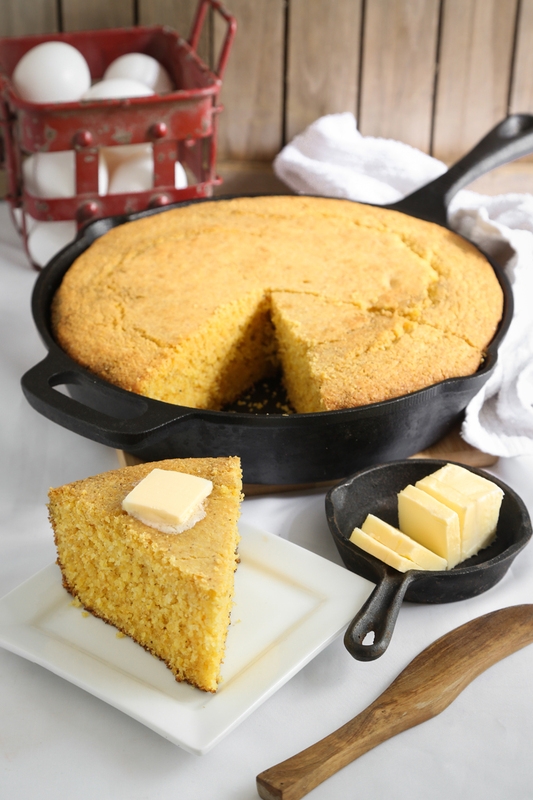 So rare to find published recipes for proper cornbread. Most "cornbread" recipes read like cake with cornmeal to me. Thank you for the kind words (and gold star!) - I agree. So many cornbread recipes call for flour which ruins the crumbly texture. I made this tonight. It was beautiful and I was so excited to eat it....but, while I didn't *think* I liked sweet cornbread, the lack of sweetness really was a shock and I think it was too non-sweet for me (if that makes sense). Would this work if I were to add some sweetness? Thank you so much for trying the recipe! You can certainly sweeten it up with a little granulated sugar. You'll need to add at least 3 tablespoons to taste any sweetness at all. I'd recommend 1/4 cup of sugar - that will give it more obvious sweetness but it will still taste mostly savory. Mix the sugar in with the dry ingredients and proceed as directed. Thanks for your question! I'll add this information to the recipe. I need to try this! I love cornbread and I'm always looking for a good recipe! Hi fantastic recipe. Made it yesterday (1/2 the recipe) and it was delicious!!! I think I used too much butter but I could not work out how many grams for 12 tbsp butter. It was buttery and crisp on the edges - did not need anything else with it except a nice bowl of slow cooked red beans with smoked bacon bits!!!!! 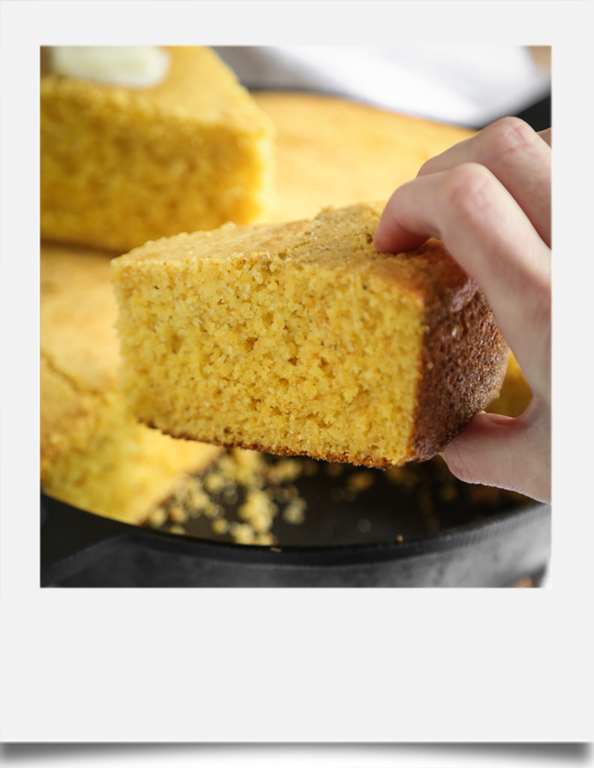 My husband is from Louisiana and his dad was the only one who made cornbread the way he likes it, until I tried this recipe and in his words " spot on " and in my words this recipe is a major hit. I have been looking for an unsweetened cornbread recipe, thank you for sharing this recipe. I love it with okie beans! I have been trying different receipts for cast iron skillet corn bread this is the best by far, like grandma used to make. Grandpa ate his in a glass of milk also. Thanks for sharing.